Identify your staff with your brand image. Creating your own personalised lanyards is cheap and adds visual impact. Use your brand image to create your design in only a few minutes thanks to our new online tool. Receive your personalised lanyard order in no time at all, with guaranteed delivery. Choose between our affordable models with top quality finish. Take advantage of the different options to design your unique ID lanyards. Make your brand visible in full colour. Bespoke design that adapts to your need with the best print quality available. Help associates and customers identify themselves with your business. Find an original design and they will be used beyond the event and workplace. Besides carrying IDs, they can also be used as keychains or other accessories. Where to buy personalised lanyards? Personalised lanyards are usually purchased through companies that provide personalised promotional merchandise. These companies normally offer an online design experience that makes designing your promotional merchandise such as promotional lanyards a very quick and simple process. Depending on the type of lanyard you would like to order, you can choose between a simple one colour print or a full colour print. 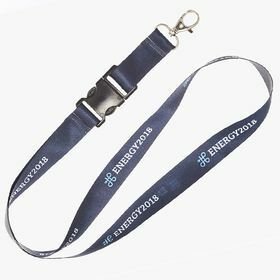 How to make promotional lanyards? Firstly, you have to decide which type of lanyard you would like to buy. Choose between a basic collar lanyard which comes in a variety of colours and is perfect for affordable promotional support or a full colour lanyard which is very customisable, can be printed in full colour and has four additional attachments that you might desire. After choosing the perfect model we get to the interesting part. By using our easy-to-use online design tool, simply add your design or images and start organising and changing the design until it is exactly how you want it. Once you have finished your design, we will check it for free to make sure that it will be produced perfectly and once it has been printed we will check the finished product as well. The final step is the easiest; all you have to do now is sit back, relax and wait for your personalised lanyards to arrive. At Camaloon we provide a wide range of promotional merchandise that your company could use to their advantage. Every time an important event or fair pops up, you want everything to be perfect until the very last detail: the stand, the commercial brochures, the logo badges, the magnets with your contact information, etc. But perhaps something is missing, for instance, personalised ID lanyards with your brand image printed on the collar. These are very useful to help your staff stand out or to hand out to your VIPs. We offer two different models, ready to be personalised with your design or brand image. You can also add some complements to obtain the best possible result. From simply using a single colour to print your logo to choosing the background colour and different ways to display your business name. Independently of what you choose, our lanyards are affordable and easy to personalise. Personalised T-shirts are an ideal product for a large promotion as they are comfortable to wear and versatile, and you can even create your own design to use with our online service. They can be used as part of your employee uniform, so people at fairs and events have no problem locating your stand and staff to conduct business. Also, try smaller items such as pens and also items that can be of everyday use like personalised mugs and bottles.